If I had to pick a theme this year, it would be expand! As more and more booths expanded up to the 2nd and 3rd floors, and off to distant places, requiring even more walking than normal. 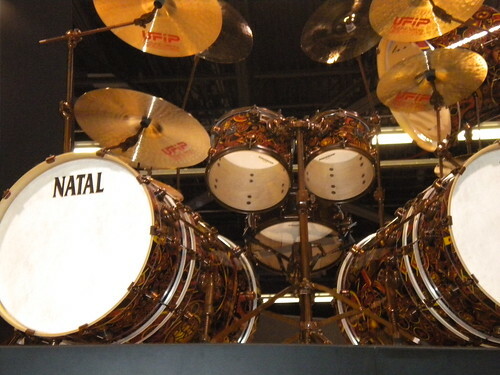 I won’t cover every thing I saw, but I will hit the more interesting things I saw in the world of drums. 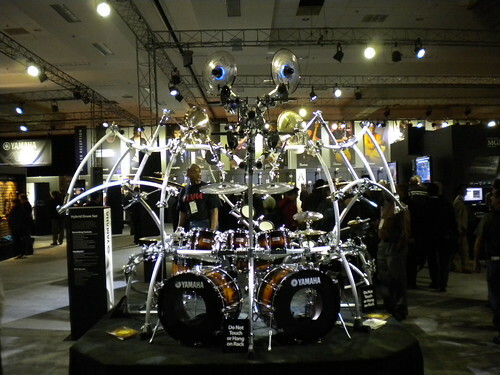 The absolute undisputed star of this years show was the new Atlas hardware system from Ludwig. In short, it’s a new bracket that replaces an existing lug. It acts as a lug, as the tom holder, eliminating the need to drill for a separate tom bracket or use a RIMS type mounting system. It also can act as a cymbal holder, and as floor tom leg bracket. 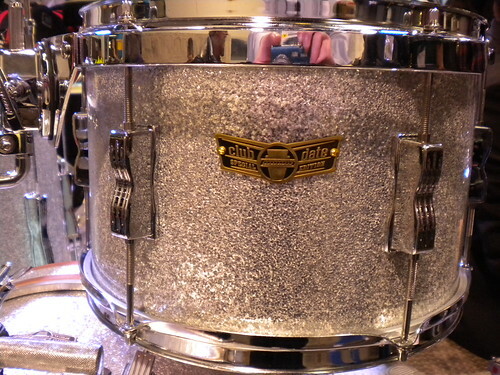 And the best aspect is the bracket screw is adjustable, so it can retro fit non-Ludwig drums. Yamaha rolled out the new Live (Oak) Custom, which blends features of the their Maple Absolute with their previous Oak Custom line. The result is a great sounding drum kit. 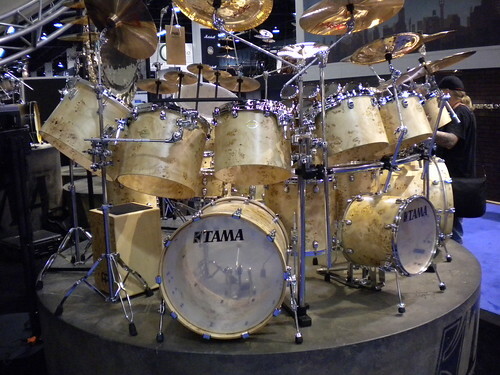 The construction of the oak shells allows you to have smaller sized drums to have a HUGE sound. 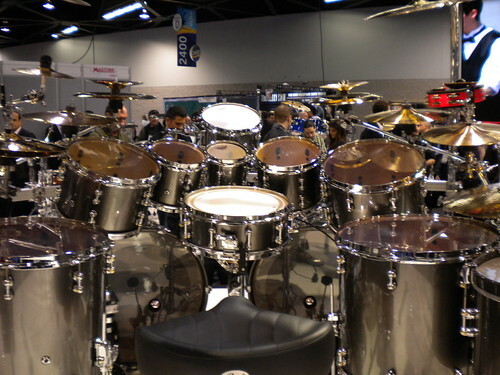 The 14×22 bass drum sounded monster, and the 20″ bass drum sounded like a much bigger drum. I did think their was a point of diminishing returns, as the larger bass drum on display actually didn’t sound as good as the 14×22. 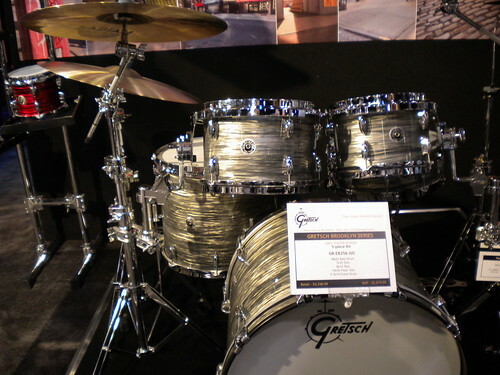 It’s only available in 4 finishes, but it was the most exciting new drum kit of the show. Pearl brought back their famous Export line. A Pearl Export was my first drum kit, so it warmed my heart to see an old friend return to production. Unlike the last few Exports that had been so upgraded they ceased to be entry level kits, this “new” Export is a throw back to the 80’s version of the Export as a well made entry level kit. And even the price is a throw back to the 1980’s, as it’s very affordable. The best part is it is now available with a 20″ bass drum, which is good for parents looking for a kit for younger children. 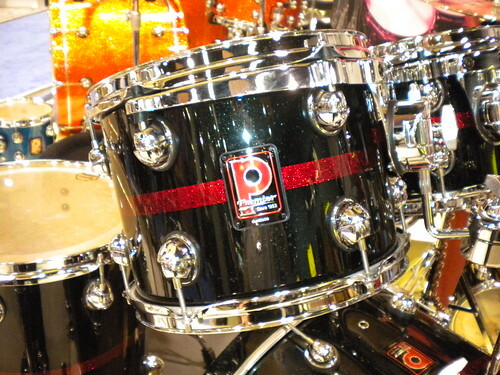 Tama has a new “Star” line. The news in cymbals was Zildjian had redesigned the famous “A” line to be a throwback to how the “A”‘s used to be pre-1980’s. 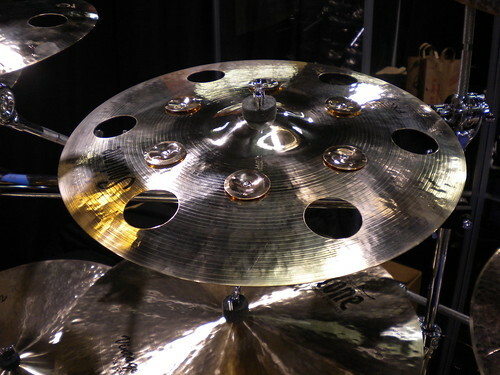 The cymbals run thinner, and feature a new logo. Also featured was a 23″ Sweet Ride. It has a nice mix of spread and ping. Really sweet spread, but I noticed it never got overly washy, and there was no annoying overbear roar you often get when playing a lot of notes on a big ride. It was almost like it had a built in compressor so you could get all the nice spread of a thinner ride, but without it washing out on you. Also, Zildjian has taken the electronic mic/pick up system used on the Gen-x e-cymbals is now available to used on regular cymbals. The downside is you have to drill a small hole. I couldn’t believe it when my rep told me you really have to drill, but he says enough people requested that this system be adapted to regular cymbals, they made it. 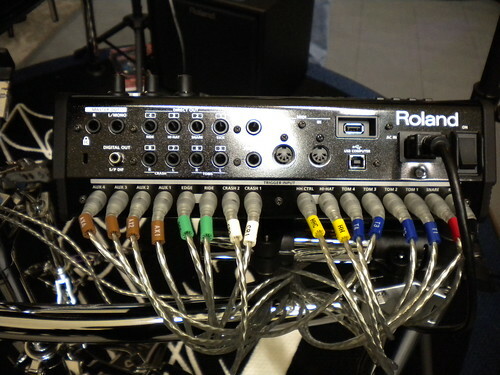 It’s neat, and adds a cool visual aspect as well as a great sonic aspect for live and recording. But drill? really? I don’t know about that. 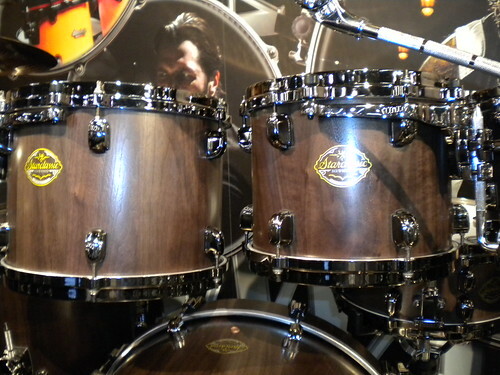 Premier is still working on their come back to the US market: and featured a line of nice wood snare drums. Amedia cymbals had a square ride, which actually sounded rather pleasant, similar to a K ride. 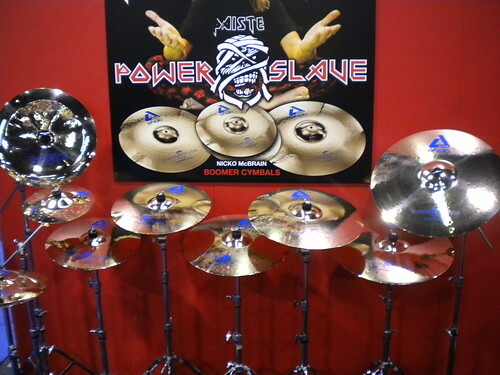 Also an 18″ cymbals with a massive bell. I’m not sure it was a ride, as it was rather thin. It seemed to be more of a special effect type cymbal. Gaai is a small custom drum manufacture. What struck me is I have never heard so much low end coming from an 18″ bass drum. But what really caught my attention was the use of Cork in place of a suspension mount. Gretch proved what is old, is new again. But, really? Clip mounts? KMS has joined forces with KAT to make a new line of quality affordable electronic drum kits. For a $599-$699 price range, these were impressive. Liberty is a new name to the US drum market from the UK. They look nice, but do we need another brand? Also of note was the new Evans drum head 360. 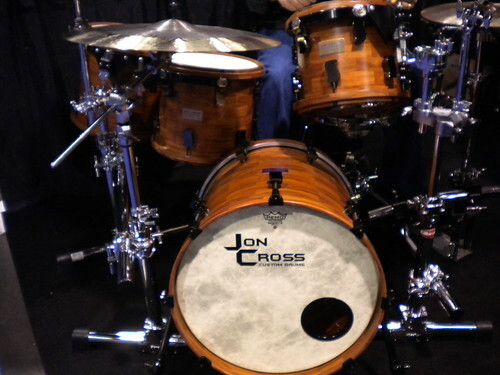 It is not a new head, but a new collar design that will be applied to all existing tom and snare drum heads. The new design allows you to throw on a head and get a working tone right away without having to seat the head. And once tuned up, it will hold it’s tone, even when a tension rod is removed. I was very, very impressed by the live in person demo. It really makes you wonder why they and Remo have not done this before. But it is note worthy that Aquarian has had a similar concept in place for years. A problem I had to deal over the last several months was rats in my yard and garage. I learned a lot about rodents in the process of dealing with then, and I was stuck how rodents are similar to business rats (i.e. fraudsters), and they key to stopping both is organization. As I have written before, most work place fraud is not committed by people who took their job with any intention of ever committing fraud. Fraud is a crime of opportunity. Rats are animals of opportunity. Rats did not set out to invade my garage, they stumbled across the safety and food opportunities of my garage while exploring for a place to live. Fraudsters do not set out to commit fraud, rather they stumble across a weakness in a company’s internal controls, and decide to take advantage of it. Rats find the dark corridors of your home where they feel safe and out of view to do their dirty work. Fraudsters find the dark corridors of your business system where they feel like they can get away with their dirty work without anyone noticing. Setting traps in their path does not necessarily catch the rats, because they sense there is something in their path that was not there before, and learn to avoid this new trap, or just leave. Setting new internal controls does not necessarily catch a fraudster, but because they will often notice the new control, they will most likely just stop committing fraud. I never caught the rats in my garage. The only way I got rid of them was to take everything out of my garage, clean it, and put everything back. The rats sensed everything was now different, and they simply left. As I pulled items out of my garage, I thought I had been well organized, but I noticed the areas behind boxes, and the corners where I had not previously noticed small bits of clutter. It occurred to me this was like so many offices I have seen, where the files look nice and organized, but behind the pretty front are unorganized files and weak internal controls, which provides opportunity for a potential fraudster to take advantage of an unorganized business. The key to stopping rats in my garage was to be extremely organized and keep every aspect of my garage clean. The key to stopping fraud in a business is to be extremely organized with internal controls to keep your business systems clean. “Praise is like sunlight to the warm human spirit; we cannot flower and grow without it. And yet, while most of us are only too ready to apply to others the cold winter of criticism we are somehow reluctant to give out fellow the warm sunshine of praise”. A place I worked early in my career went through two bosses. Boss one was rather unhappy in his own life, and he took out his unhappiness on other employees. He screamed and yelled. He was not above picking up the public address system and screaming obscenities at the staff. As you can expect, turn over was rather high, and productivity was low. We could not keep good people, and those who stayed worked out of fear, which as we know, does not produce the best results. It was a miserable situation. Upper management eventually noticed his poor leadership skills, and he was let go. As in interim, the district manager stepped in. It was a lasting impression I will never forget. He was very positive, and very eager to praise the staff. He would stand outside his office and ask everyone who walked by how things were going. If someone had just made a good sale, he would praise that person with “congratulations” and high fives. If someone said “well, I only sold something small” he would come with “but that is OK, because the next one will be better.” No matter what answer you gave him, he found a way to turn it around into a praise of your work. It was highly uplifting. Suddenly, work was no longer “work” it was fun. Instead of dreading the job, I looked forward to it. It seemed like productivity skyrocketed. It became abundantly clear why he was the district manager. He earned his title from hard work and praising those around him. Sadly for me, his hard work paid of for him in being relocated to start a new venture for the company, which was quite an honor for him. So my experience working under him was only for a short week. But it was a week I will never forgot. In the music world, fans are everything. They are the bands customers. They buy the albums, concert tickets and merchandise. When a band announces that a member of the band has left the group, it can dramatically affect the fans. The fans have an emotional investment in the band, and changes can affect the way a fan thinks about the band. A typical response may be “I will not buy the next album” or “I will not see them live again.” Some bands can make changes, even drastic ones, and continue on. Some bands discover a member change dooms the band to no longer being relevant to their fans. In business, it is often the same way. Business relationships are, as we know, built by people. Customers return to do business with the people they feel comfortable with. Employees respond to managers they like. When a change occurs, it has an effect on the business in many ways. Most business owners and managers know employee turn over is a bad thing. However, usually, the reasoning is the time and cost of hiring, training, and getting new employees up to speed. What is often lost in employee turn over is the dramatic effect it can have on the customer base. The clients, vendors, and other employees are used to dealing with a certain person. They have a relationship that keeps them coming back. When that changes, clients, vendors, and even other employees have no reason to not wander off to other businesses. One case in point is a place I worked where a particular manager had built up a business unit by very hard work using his personality and doing things his way. He had built his own business with-in the business that employed him. Everyone wanted to be his client, and employees loved working for him. The business owner however, did not see much difference from one employee to the next. So one day, this manager left for a better opportunity. The customers faded away. Employee turn over sky rocketed without a solid manger in place, and the business unit shrank to a shell of its former self. The fans no longer had a reason to support the band. In another company, there was a manager who ran the entire behind the scenes aspect of the business. When that manager was deemed no longer valuable, a change was made. But it became the equivalent of taking the main support beams out of a building. Everything quickly collapsed. Early in my career I witnessed a business where everything was built around the manager. When the manager left, the business folded with in a few years. Could these situations have been avoided? Of course. In music, the problem becomes the ego of individual members cause them to think they are better than the sum of the band. In business, I have observed owners take the attitude of “my business is so good, I can deal without them.” The reality is the fans – the business clients, may not share such thoughts and drift away. In future posts, I’ll share my thoughts on employee retention.